I think that Apple has done a terrific job of getting us healthier with the Apple Watch and the iPhone but it’s a miracle that any of us have figured any of it out. Just to start a workout is often six separate steps of tapping and swiping and scrolling. But that’s not the hard part. For me the hardest part has been trying to unravel the mysteries of getting data to show up about my exercise. I’ve started the writeup for this article four separate times. I keep walking away from it because I realize that I don’t fundamentally understand it. I’m hoping that I’ve finally cracked the code but I fully expect one or more of you to write to me and say, “no dummy, THIS is how it works.” I’m going to take a crack at it anyway. The iPhone has a motion co-processor in it, the function of which is to collect sensor data from integrated accelerometers, gyroscopes, and the GPS. Armed with only an iPhone you can track your health and fitness. But let’s not do the easy thing, let’s throw the Apple Watch into the mix because it becomes SO much more entertaining to explain. I’d better start with an end goal here, or some might call it a Problem to be Solved™. My goal is to have an app or apps on my iPhone that will collect metrics of my activity and display them in a graphical way. On the Fitbit app I used to get a nice graph of the week or months step count with a line showing my goal so I could see how often I was beating my goal and how much. So I want that kind of information for the active calories, and my step count as a minimum. You might be saying, “well Allison, the Health app does that for you!” Technically the Health app does show a graph but it’s awful. You can’t tell what your goal is or how many steps you’ve taken. For me it shows a line at 25,000 steps (and even I don’t go that far) at the top, and a line at 5000 steps and in-between a bunch of bars with no scale. It’s pretty much useless graphs all around. 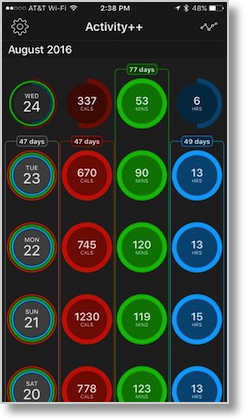 I mentioned before that that Don McAllister told me about an app called Activity++ that will show in really nice circles how you’re doing on the three Apple rings – active calories burned, minutes of exercise and stand goals. It also shows you how many days you’ve been on a streak so for me it shows 77 days on exercise of 30 min a day, and now because of the inspiration I talked about last week I’m at 47 days for all three rings. But I complained about not being able to see my step count. Luckily Alastair Smith from plusplusapps.com caught wind of what I was saying and pointed out that the developer, David Smith, also had an app called Pedometer++. The irony is that I HAD that app on my phone (didn’t know it because once it’s downloaded it’s called Pedometer on iOS). I fired it up and it showed no data. So, here’s the point of this article (took me a while). How do you get an app to be able to get the data from your watch but not double count any iPhone movement? There’s a LOT of moving pieces to this puzzle, which is why I started by saying I can’t believe anyone has figured this out! The Health app is the aggregator of everything. It takes motion data from the phone and the watch and it controls what access third party apps have to read and write health data. Now in my case, I don’t really want any more data written to the health app, I want to get data out of the health app and into my third party apps. Here’s the plot twist. The Health app can only grant access to those apps that ask for it. You can’t start at the Health app and push data towards an app. Let’s walk through an example using Pedometer++. 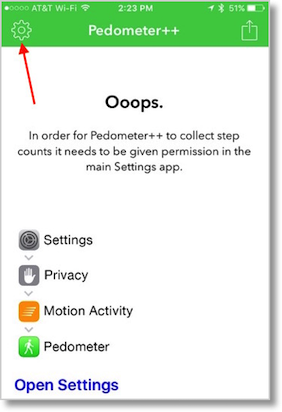 When I first opened Pedometer++ it came up with a screen that said “Ooops.” and explained that in order for it to collect step count it needs to be given permission from the phone’s Settings. As far as I could figure out through exhaustive experimentation, going to Settings, Privacy, I was unable to turn it on from there. But, inside Pedometer++ I tapped on the Gear and saw a switch that said “Merge Apple Watch Data”. It says that it can intelligently merge motion data from your iPhone and Apple Watch. Now that’s pretty cool. I turned that switch on, and a window popped up telling me that Pedometer (without the ++) wanted access to my Health data. THAT’S what I’ve been looking for. Ok, now it gets interesting. In here you can allow Pedometer to write (which again I don’t want it to do), but if you scroll down you can allow it to read your Active Energy, Heart Rate, Steps, Walking + Running Distance and Workouts. I flipped all of those switches on, and then hit Allow in the upper right. 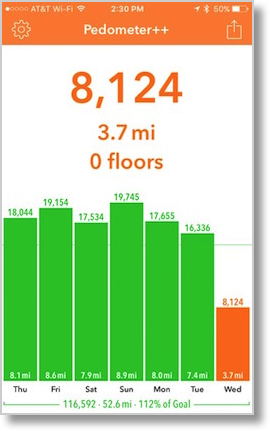 I was immediately rewarded with a beautiful graph showing me my steps (only 8124 so far today, still need to go on my second walk) and 3.7 miles, but also nice green bars showing that I’d passed my 16,000 steps per day for the earlier part of the week. If your third party app does not have a switch about merging Apple Watch data intelligently with your iPhone’s data, I highly suggest that you go into Settings on the iPhone, select Privacy, Motion & Fitness and turn OFF Fitness Tracking. This is a trick Bart showed me that tells Health not to collect any data at all from the phone so that the Apple Watch alone gets to supply the data. A while back the SMR Podcast guys did a fitness challenge and they used Microsoft Health to collect the step metrics. For some reason I was getting far fewer steps recorded by the Microsoft Health app than showed in the Activity app. The same thing happened when Pat Dengler and I tried to use the Argus app to compare step counts. Oddly both of these apps got the same wrong number. I opened a case with Apple and for weeks pestered them about it. The answer was that neither of these apps had permission to read my Apple Watch data (and never asked for it) so they were only getting my Phone’s data. Wish Apple had been the one to figure it out, but it wasn’t. It was the experiments Bart and I did with turning off Fitness Tracking from the watch. So if your app doesn’t ask for access from the watch, find a new app! Activity++ combined with Pedometer++ give me everything I wanted but it would be swell if the two apps were combined. One more thing, Pedometer++ is fully accessible through VoiceOver, but for some reason Activity++ is not accessible at all. Now that I have Alastair’s email address, I’ll be sending him an email asking David to get Activity++ up to par with his other app. CORRECTION: I have no idea why the app didn’t respond the first time, but this morning Activity++ is gloriously accessible! Thanks Allison. I’m using Pedometer++ and Activity++ and like you find the UI more useful than the Health app. I have set up Pedometer++ as you described, I noticed that my steps differ between that and the Health app. I’m also using Pedometer++ on my Apple Watch. Any ideas on the discrepancy? Seems that Pedometer++ shows about 10%-ish more steps than the Health app. Did you tell the phone to stop generating health data? It’s probably getting too much data. Aren’t the little confetti showers fun? “go into Settings on the iPhone, select Privacy, Motion & Fitness and turn OFF Fitness Tracking. ” See if that works? And no worries on the spelling, I often spell it ”AlIsion” myself. I did that, closed and reopened Health, Activity and Ped++ and the data did not change and then walked around for a few minutes and neither of the apps recorded any steps. Do you have any other ideas for me? Also FYI in the Apple Watch app under Privacy, Motion & Fitness, Heart Rate and Fitness Tracking are enabled. I turned off Motion & Fitness Tracking in the iPhone – Settings – Privacy for everything. Did you just want me to turn it off for Pedometer++ ? Thanks again. It sounds like you did the Health part correctly. 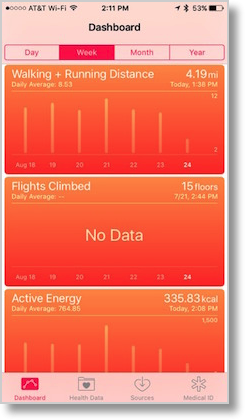 How about the switch inside Pedometer++ to intelligently merge Apple Watch data? Shouldn’t matter but if that’s not it I’m out of ideas! I got an email back from my support request. The following are the recommended settings from Alastair. The following are all the settings for Activity++ and Pedometer++. 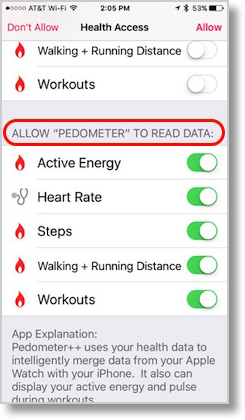 “Merge Apple Watch Data” in Pedometer++ “Settings” should be on. iPhone “Settings”, “Privacy”,”Motion & Fitness”. “Fitness Tracking”, “Health”, and “Pedometer” should all be on. “Activity++” – Allow “Activity++” to read data for everything. “Pedometer++” – Allow Pedometer++ to write and read data for everything. “Motion and Fitness” and “Background App Refresh” on. “Notifications” – all options on if you want step count on badge icon. iPhone “Settings”, “General”, “Background App Refresh” should be on. iPhone “Watch”, “My Watch”,”Privacy”, “Motion & Fitness”.